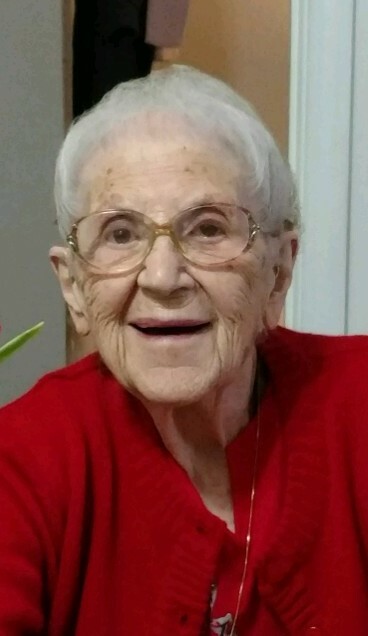 Obituary for Adeline "Lena" (Mercia) Rosato | Scala and Roefaro Funeral Home, Inc.
Mrs. Adeline “Lena” Mercia Rosato, age 102, passed away on Saturday November 24, 2018 at the Masonic Care Community with the love and support of her beloved family. She was born on March 30, 1916 in Utica a daughter of the late Nicholas and Nancy Libertrice Mercia and was educated in local schools. On July 5, 1941 she was married to Sam Rosato in St. Anthony’s Church, a blessed union of 67 years until his passing on December 25, 2008. Lena, along with her husband Sam were the owners and operators of Rosato’s Bakery for many years, until their retirement. Lena was a loving and devoted wife, mother, grandmother and great grandmother who loved her family dearly. Lena's home was always open, she made everyone feel welcome and like family. An avid NY Yankees fan, she was looking forward to see them win one more championship, she waited as long as she was able. Especially dear to Lena were her many family members and friends who remained in close contact throughout her life. Although missed, Lena will live on in the memories and love she has gifted us. Surviving are her beloved daughter and son-in-law Mary Lourdes and Mitch Schenkel of Rome, NY; her beloved son and daughter-in-law Sam and Mary Rosato of Vestal, NY; cherished grandchildren Alyssa and Kevin Hogan, Michael and Aimee Rosato, Kristin and Keith Eberle and Mitchell and Megan Schenkel; cherished great-grandchildren Mia Hogan, Michael Hogan and Eleanor Schenkel and several loving nieces and nephews. She was predeceased by three sisters Margaret Napoli, Fanny Fasone and Mary Lisandrelli and two brothers Patsy Vizzacaro and Anthony Marica. Relatives and friends are invited to attend her Mass of Christian Burial on Thursday at 1:00 pm in St. Anthony/St. Agnes Church. Private entombment will be in Calvary Cemetery Mausoleum. The family will greet all visitors at the conclusion of mass in church. In lieu of flowers, please consider a donation to your favorite charity.